En este ejercicio de listening escuchamos un reportaje de CNN sobre un futbolista muy famoso y aprendemos cuánto gana. Haz clic aquí para aprender vocabulario relacionado con el tema y para practicar tu inglés oral hablando con uno de nuestros profesores nativos de inglés. 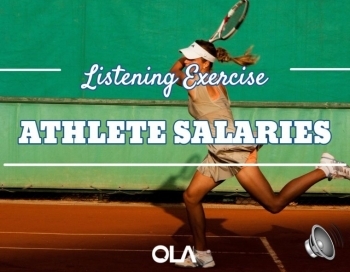 También verás en la lección un artículo sobre Salarios de los Atletas, además de un ejercicio de writing sobre el tema. Mira este vídeo sobre los deportistas más ricos del mundo y contesta a las preguntas del ejercicio de comprensión auditiva abajo. 1. ...and being Cristiano Ronaldo, arguably the _______ star of the ______ sport in the world is very ___ business. 2. Now the most ________ soccer star, Ronaldo made his name at Manchester United. 3. That made him the _______ paid player in team history. 4. But he became the most expensive _______ ever, when he moved to Real Madrid. 5. He's currently signed __ a 5 year $206 million deal. 6. He's been named the most ________ soccer player. 7. Ronaldo _______ home $28 million in endorsements last year. 8. That's $80 million _____, making him the second highest paid athlete in the world. 9. He's known by a ________ 84% of the worlds population. 10. But for all those accomplishments, Ronaldo ___ ___ to win a world cup for Portugal.